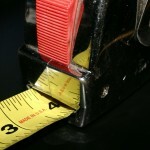 Tape manufacturers use both the metric system and the standard measuring system when designating tape sizes. The thickness of the tape is measured in “mils” which translates to “thousandths of an inch”. Good quality gaffers tape is at least 12 mils thick. The width of a roll of tape is measured in millimeters or “thousandths of a meter. Even though a standard roll of duct tape is considered to be two inches wide, it is actually only 48 millimeters wide. The most common lengths of tape are 60 yards for most cloth tapes and 36 yards for most vinyl tapes. Why tape makers continue to mix measurement standards may remain a mystery forever.